The sky’s the limit for your new construction! Why not set yourself up for success with a customized pre-wiring to match you or your client’s needs? 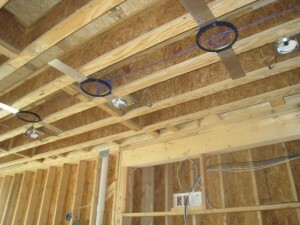 One of the biggest mistakes a homeowner can make is not thinking ahead when it comes to wiring. If a year down the road that you want to connect your mounted TV to the cable box several feet away while still hiding the cords, you’ll be smashing a hole in your wall. This is just one small example of the major construction changes people often make to accommodate new and upcoming electronic options in their home. If you do not plan ahead they can mean big hits to your wallet when it comes to construction costs! Don’t fall victim to an unplanned wiring necessity! McCray Communication offers pre-wiring services for new construction of both homes and businesses, so you can always stay ahead of the game. Our all-inclusive pre-wiring service allows you to ensure your home will be ready to accommodate cable TV, home theater wiring, whole-home speaker wiring, alarms, network cabling, security alarms, TV, phones, and so much more. Wire management can save you so much time and effort down the road, so give us a call before your home or business is drywalled! Our one time, quality, and affordable new construction pre-wiring services are just a phone call away! Schedule your no-hassle consultation today.